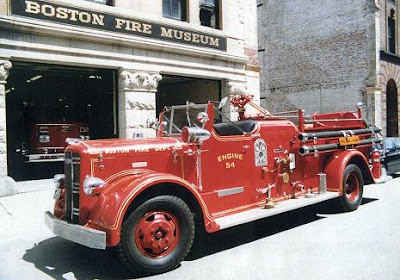 The Boston Fire Museum  and The Boston Sparks Association, located at 344 Congress St. at the corner of Farnsworth St., will be hosting their annual BBQ Cookout on Friday, June 8 from 5 PM to 8 PM. The BBQ is our major fellowship event which brings many of our 200 members together from all over the New England area. As in the past, Farnsworth St. will be closed at approximately 3 PM between Congress St. and the alley behind the fire museum. Vehicles will be able to access Farnsworth St. from the alley off Sleeper St.  Vehicles can leave Farnsworth St. via the alley leading to Sleeper St. or the alley leading to Thomson Place. Members of our organizations will be available to assist anyone who has difficulty in reaching their destination on Farnsworth St. Notification of the BBQ and the closing of Farnsworth St. has been sent to our neighbors and building managers. We extend the invitation to our friends in the Fort Point neighborhood to join us at our BBQ. Anyone planning to attend is requested to call our answering machine at 617-338-9700 and leave a message indicating how many will attending. We will also be available to give you a tour of the Boston Fire Museum and the quarters of the Boston Sparks Association.